It is a great craftmanship, elegant and luxury, but in afforable price. - Exclusive Aluminium Alloy clasp and steel head , easy to install and remove. - Minimal design, lightweight and flexible. - Many colors for your preferences, Black, Silver, Rose Gold, Gold. Suitable for all kind of people. - Eco-friendly, low-key , elegant and practical. Best gift for yourself , your family or friends ! Swees is a registered trademark and brand in United States and protected by US Trademark Law. Swees never authorizes any other third-party to sell our products, and please directly buy from offcial store sweesdirect to get the authentic products in guarantee and protect your own interest. Perfect Milanese Metal Band fit for Fitbit Charge 2 hr heart rate (Tracker is NOT included). Small size fits for 5.5" - 8.5" wrist. Large size fits for 6.1" - 9.9" wrist. The unique magnetic closure clasp allows you choose the most comfortable size for yourself. Two durable stainless steel connectors lock the fitbit charge 2 securely, very easy to install and remove. 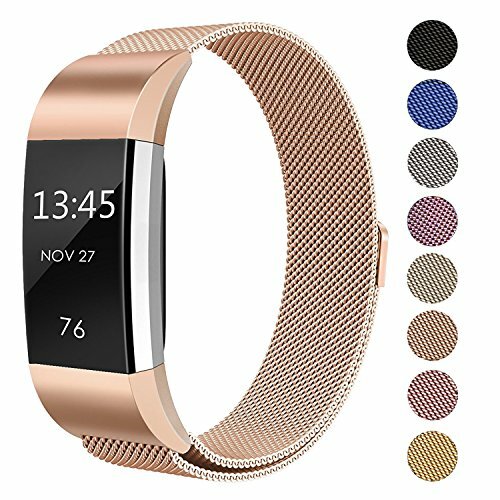 Multiple color bands are available for fitbit charge 2: sliver, black, gold, rose gold, blue, colorful, rose pink, champagne. If you have any questions about this product by SWEES, contact us by completing and submitting the form below. If you are looking for a specif part number, please include it with your message.